What's in Ubud? Read on to find out. To be honest, we weren’t sure what to expect from Ubud. It’s the central destination for culture, art, yoga and spirituality in Bali and we wondered if it would have such a hipster Eat, Pray, Love vibe that we would spend our entire stay rolling our eyes. We booked a few nights, with the option to stay longer if we liked it – and we did. We really enjoyed our stay in Ubud. Some complain that the Starbucks and other brand named retail shops make this small village feel less authentic. However, it doesn’t take much effort to look beyond that and figure out what’s in Ubud. There are so many quiet spots and local experiences to enjoy. I found Ubud to be just the right size for a 4-5 day stay. There are lots of activities to do and it’s also a great place to curl up in a cafe with a good book or people-watch for a while. 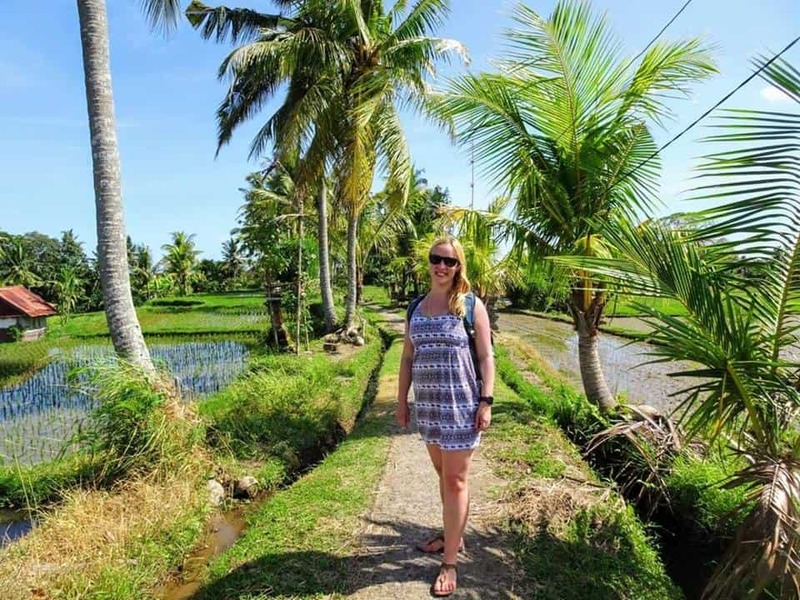 Keep reading for our tips on what to do and what to expect in Ubud. 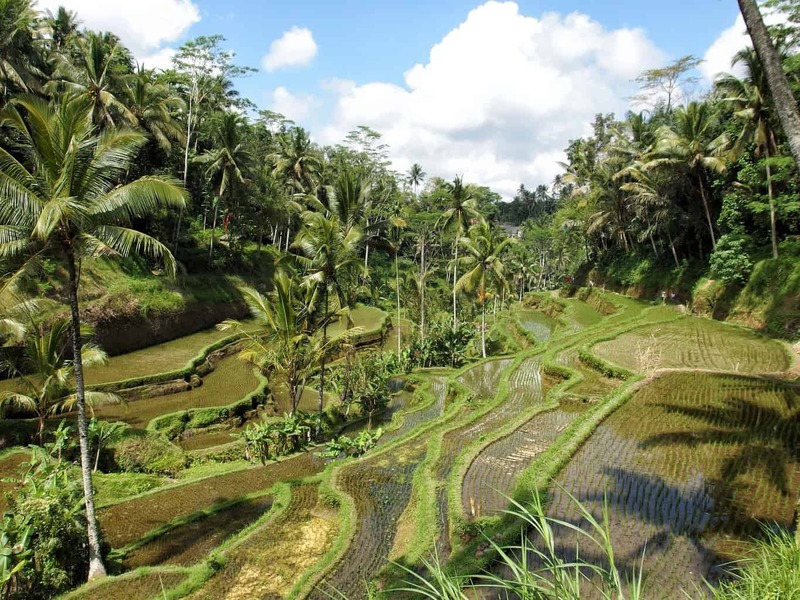 The town of Ubud was originally a source of medicinal plants and herbs. The name itself comes from the Balinese word “ubad” which translates as “medicine.” But in the late 19th century, this town became known as the seat of feudal lords of the King of Gianyar (a powerful southern state). 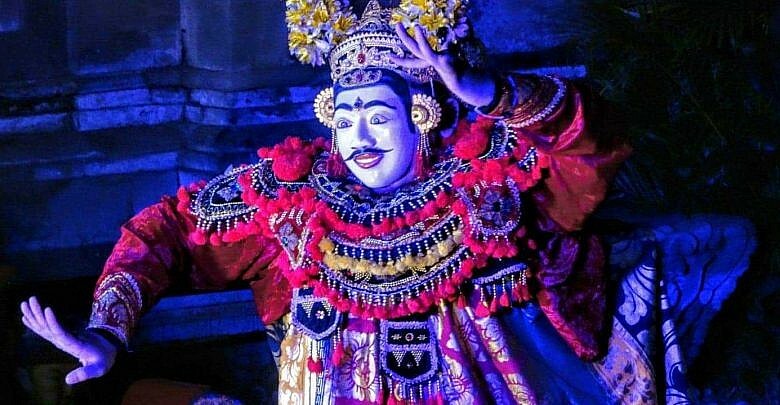 These lords were major supporters of the arts scene in the village, which is why Ubud has such an impressive history of traditional dance, painting and music. The arts scene grew even more when Walter Spies arrived. He was a Russian-born German painter, composer and curator and he moved to Ubud in 1927. Spies is credited with attracting the attention of the west to Balinese culture and art in the 1930s and influencing the direction of Balinese art and drama. He brought in some of the greatest artists from all over Bali to this region, making Ubud the cultural centre of the country. The Culture: Ubud is considered the cultural capital of Bali. The dance performances and art galleries are the best in the country. If you are interested in learning about the culture and history of Bali, this is the place for you. The Food: Ubud is one of the best destinations in Bali for foodies. It has a great selection of excellent restaurants – from local Indonesian food to burgers, pizzas, Mexican cuisine, sushi and more. (And there are a TON of options for vegetarians and vegans.) Plus, there are also many cooking classes available, so you can learn how to cook authentic Balinese cuisine. The Pace: Ubud is big enough that it has things to do, but it’s small enough that it doesn’t feel crazy or overwhelming. Plus, you can find yourself in a beautiful rice field by walking only a few minutes away from the town. Tricky Sidewalks: The sidewalks in Ubud are a mess, which makes them really hard to navigate. There are broken tiles, random holes, piles of dirt and motorbikes jutting out, which means you have to always be watching your footing. There’s been many times I’ve tripped on an uneven tile, or slammed my hip into the protruding handlebar of a haphazardly parked motorbike. Watch your step! Annoying Taxi Drivers: While you’re carefully walking down these ill-maintained sidewalks, there’s another distraction you’ll have to deal with. It’s the taxi drivers who pester you at every turn, asking if you need a ride anywhere. The Prices: While prices are cheap compared to Europe or Australia, Ubud is more expensive than many other destinations in Bali. 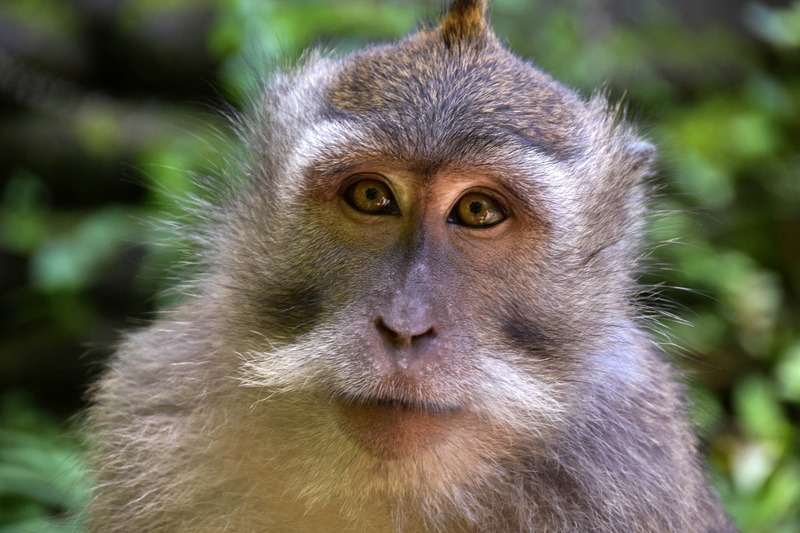 The Sacred Monkey Forest is one of the most famous attractions in Ubud. This green and shady forest is filled with elaborate temples where dozens of monkeys clambour, swing and lounge. The monkeys are considered sacred, as they are thought to be descended from the Hindu monkey-god Hanuman. It’s a lot of fun to watch them and their antics. Sacred or not – they are little rascals, notorious for snatching purses, sunglasses and jewellery from visitors. When we were there, a backpacker had his wallet pickpocketed by a cheeky monkey and had to get the staff to help him get it back. Leave your valuable items at home and keep the essentials zipped up in your backpack. Also, don’t get too close! 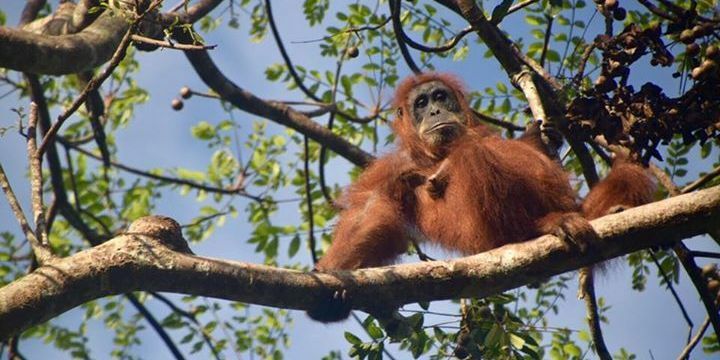 It makes the monkeys nervous and more likely to react badly to you or run away. We saw countless people trying to get a photo by getting right up in a monkey’s face – which is just a bad idea. Stay a couple of metres away and use the zoom feature on your camera. The monkeys will be more relaxed and calm and you’ll get better photos. When I saw Balinese Traditional Dance for the first time in Ubud, I fell in love with it. It’s just so intense and beautiful. The dancers are dressed in elaborate costumes covered in shimmering metal and jewel-toned tassels. They move to the sound of the Gamelan, an ensemble of drums and jangling metal xylophones placed with mallets. It sounds like percussive cacophony at first, but the more you listen the more you start to hear the complex, layered rhythm. The dancer’s movements are janky, angular, sudden and unnatural. They move like they are marionnettes on strings rather than humans. They shimmy, twist and then freeze in a pose – fingers splayed out and arms akimbo. But the most hypnotic and unsettling part is the eyes. Balinese dancers don’t just dance with their bodies, they dance with their eyes too. They open their eyes wide in an unnerving stare, shifting them left and right and rolling them back – sometimes so emphatically you can only see the whites of the eyes. The effect can be terrifying, especially when the dancer is wearing a huge, elaborate costume and dramatic makeup. But as much as these dances can be spooky, they can be beautifully sensual as well. The music slows and the dancers let their facial expressions melt into a soft gaze. Their gestures become curved and sweeping. They move around each other gracefully like palm trees swaying. It’s incredibly hypnotic… go see it for yourself! If you love Yoga, you’ll love Ubud. In this small collection of villages there is an incredible selection of yoga classes. There are dozens of classes every day, in a range of styles from fast-paced vinyasa to chilled out yin. 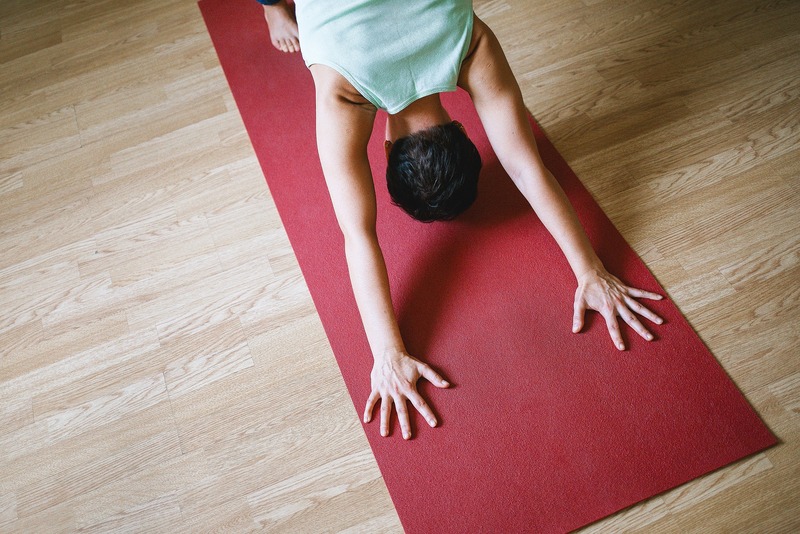 If you plan to do a lot of yoga during your stay, ask about a 3 day or weekly pass to your favourite yoga studio – it might be cheaper than paying for classes individually. I went to Yoga Saraswati and it was a wonderful experience. It costs 75,000 rp for a drop in yoga class (about $5.25 USD) and they have 4 classes per day. They supply the mat and all other equipment – all you have to do is bring your own water and towel. Wear comfortable clothing you can stretch and move in! I did the Restorative Yin Yoga class. I would highly recommend it, even if you are a complete yoga beginner. It was a very relaxing session that involved a lot of deep stretches, holding poses for a long time and concentrating on your breathing. When it was over, I was so relaxed I felt like I could just float away. 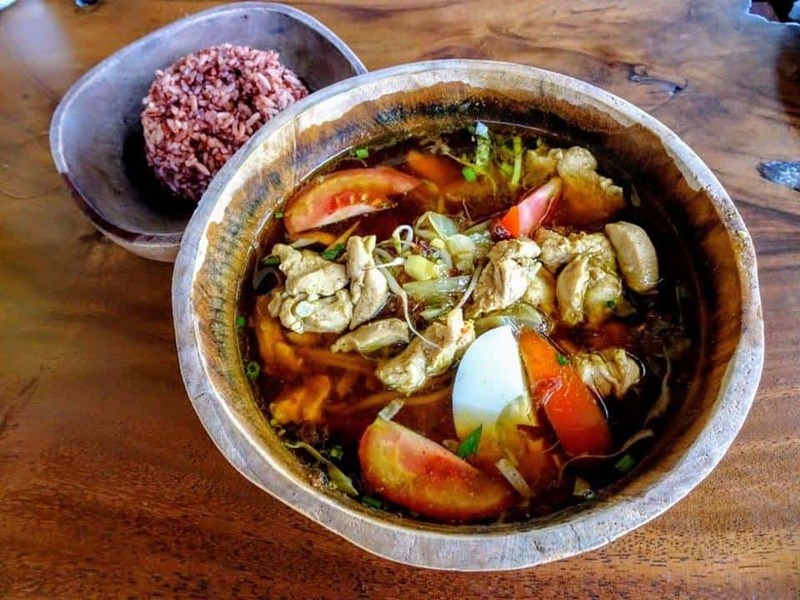 Balinese food cooked in the traditional way is simply not available in restaurants. The ingredients are too fresh and the cooking methods are too time consuming to be able to serve it in large quantities. Therefore, taking a cooking class like this is the only way to really experience the flavours of authentic, traditional Balinese cooking. Lee took a traditional Balinese cooking class when we were in Ubud and he loved it. They picked him up at the hotel and took him to an organic farm out in the countryside. He got to pick fresh ingredients and cook several dishes, including a yellow curry with lime and coconut, a sweet and sour tempe, traditional Balinese pork kebabs and much more. 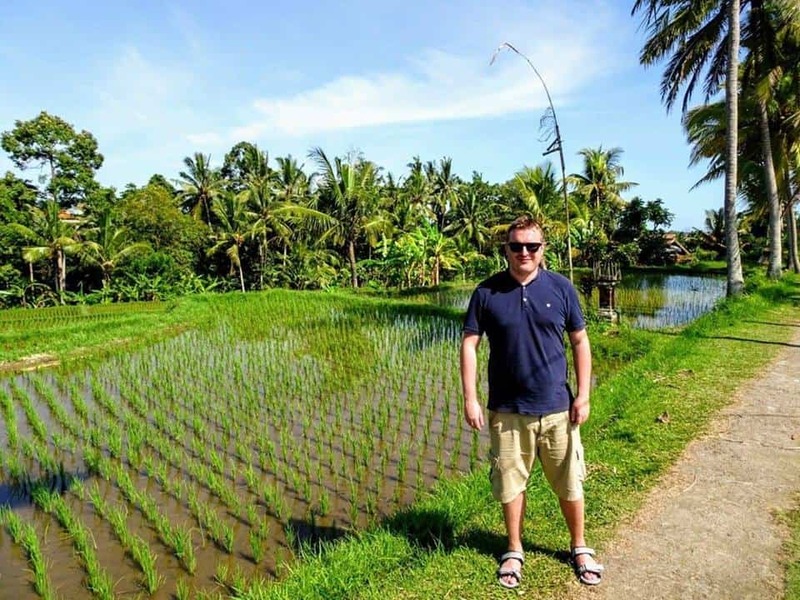 The tour he went on was this one, but there are many different cooking class tour options in Ubud to choose from. Lee made so much food in the class that he was able to take home leftovers of the fresh and flavourful cuisine for me! This restaurant is absolutely worth a visit, but you won’t stumble upon it accidently. You have to find the sign for the “Magical Rice Field” that points down an alley. Follow the narrow, overgrown path around the back of the museum until you find yourself on a dirt trail through farmland and rice fields. After about 10-15 minutes, you’ll arrive at a casual restaurant with a covered open-air dining area. The food is simple, traditional, fresh and homemade and the setting is pretty amazing. If you’re hungry, head to this restaurant and order one of the sharing platters to devour with a friend. 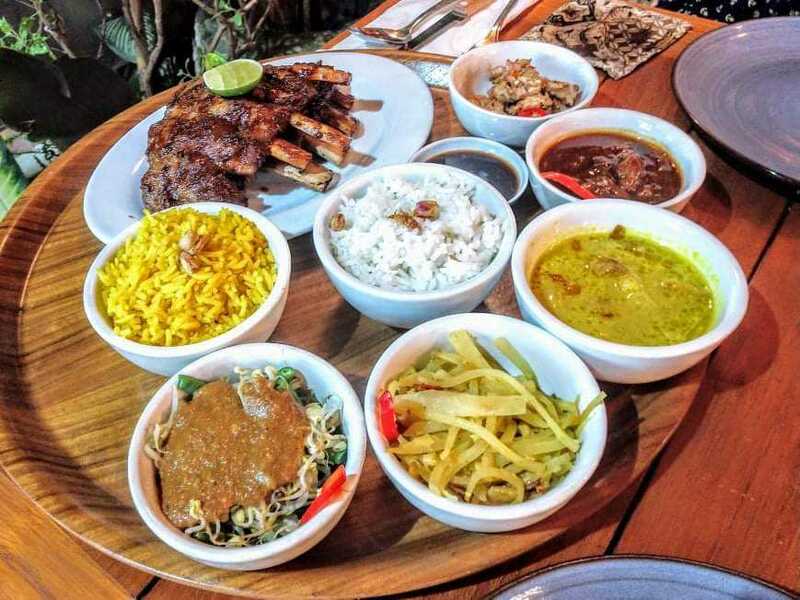 It comes with juicy barbequed ribs, meat skewers and an array of different little dishes, from juicy beef curry to yellow curry to spicy fresh salad. It’s a great way to try a lot of different flavours and the meat is so tender and delicious it just falls off the bone. PBL stands for Pizza Burger Liquor and this place is so cool. The burger was like nothing I had ever had before. 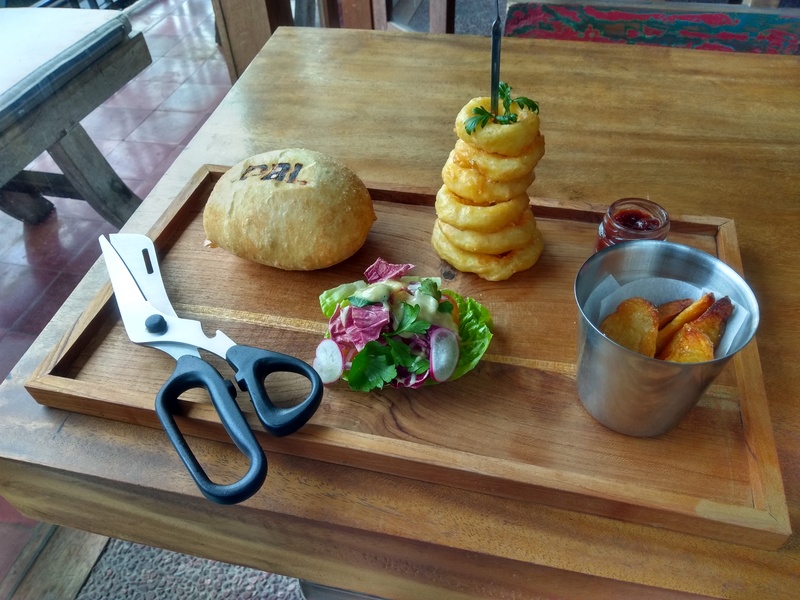 The big, juicy beef patty was cooked inside the warm, crispy bun. Then, you cut it open with scissors and add your lettuce and tomato. It was meaty, hearty and satisfying – one of the best burgers I have had in a long time. Plus, the fries and onion rings weren’t bad either. Apparently their cocktails are great too, you’ll have to try one and let me know. P.S. Sit in the chilled out upstairs section. 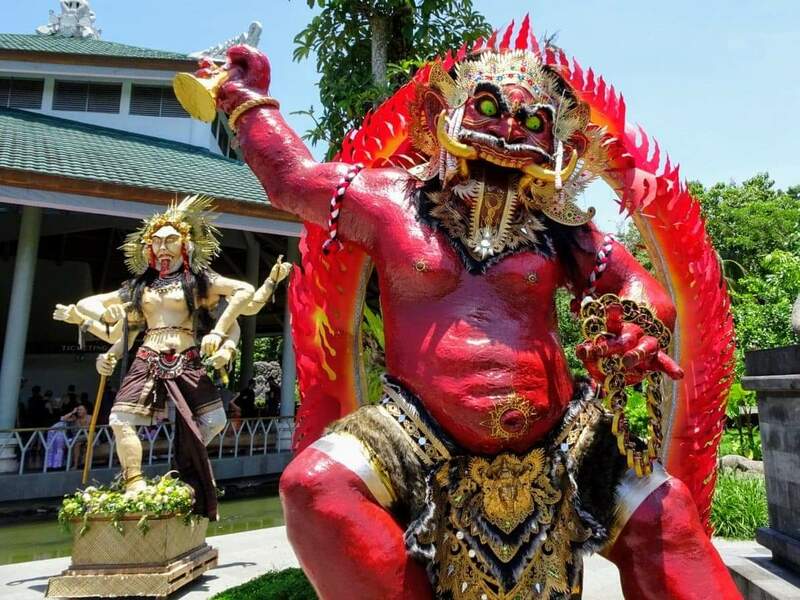 If you happen to visit Bali during Nyepi Day – the Balinese New Year – it’s a unique experience. On New Year’s Eve, the locals parade through the streets with spectacular paper mache floats they have made, depicting terrifying monsters and demons. It’s a raucous and colourful celebration. Then when the New Year arrives, everything falls silent. On this special day, the entire island completely shuts down. All the shops are closed, the roads are deserted and there are no lights. The airport shuts down, with no flights landing or taking off for 24 hours. Even the phone companies turn off their signals. The idea behind the 24 hour silence is to make the island appear deserted, so that any evil spirits flying overhead will move on and make trouble elsewhere. It’s also a time for reflection and introspection. You can do what you like as long as you stay within your resort, but if you keep your light on in your room make sure you close the curtains! If you visit during Nyepi, be sure to take a moment to step outside at night and look at the stars. The complete lack of light pollution means that you can see glittering galaxies and even shooting stars. You’ll probably notice that every morning the staff of your hotel will place small woven bamboo baskets on the ground, filled with a pinch of rice, brightly coloured flower buds, crackers and candy. 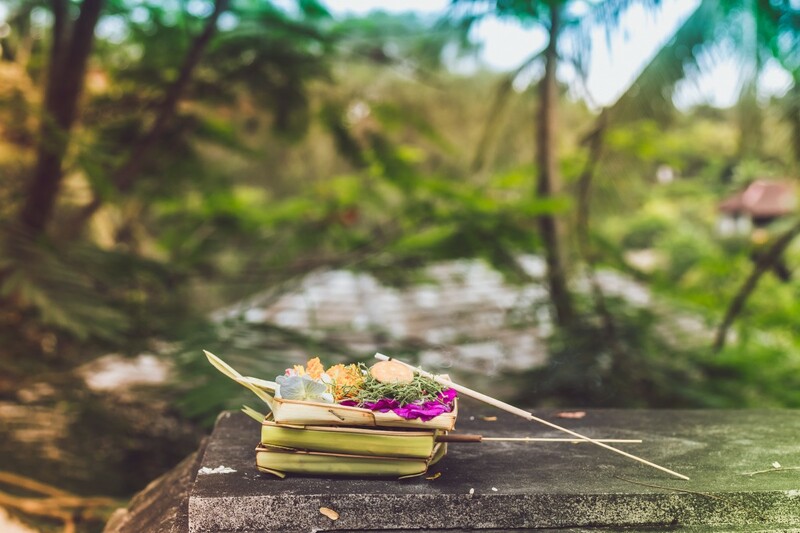 These are small offerings to the Gods and you can see them everywhere you go in Bali. They are on the sidewalks, on small shrines and in doorways. They are a way of thanking the supreme god of Hinduism for the peace given to the world. The philosophy behind the offerings is a self-sacrifice as they take time and effort to prepare. When you see a Canang Sari on the sidewalk, try your best to step around it rather than stepping on it or over it! If you’re planning a trip to Ubud and have any questions, leave them in the comments below! Or, if you’ve been to Ubud and you have a recommendation, please share it!